A leading supplier of commercial building products used to rely on a library of spreadsheets for its engineering calculations. It meant a lot of tedious manual work: data entry, checking and verifying, cross-referencing and so on. Then two years ago they appointed a new Head of Engineering who was a long-time Mathcad user. He quickly saw an opportunity to streamline and enhance the company’s engineering processes and began a project to convert all those spreadsheets into Mathcad documents. With Eurocodes becoming a design standard in civil and structural engineering, Mathcad delivers even more, “with drag and drop modules that allow engineers to pull the relevant parts of the codes into their calculations.” Automating so many previously manual steps speeds the design flow, eliminates data entry errors and makes it easy to test various scenarios to find the ideal design solution. Why nor download our latest Mathcad case study to read all about his experiences? Equations are fiddly things to construct in a document, email or web page – it’s almost impossible to make them look right without a dedicated equation editor. 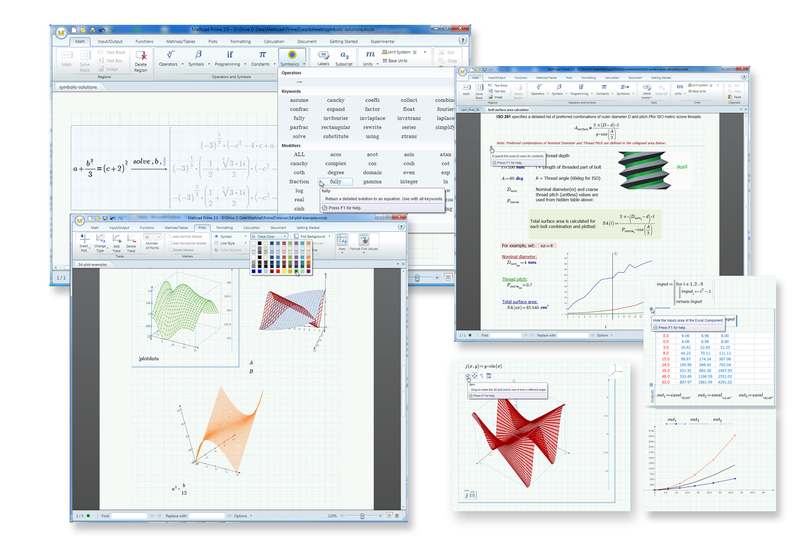 The Equation Editor that’s bundled with Microsoft Word has hardly changed in almost 20 years, so for a flexible, inexpensive solution that’s easy to use, has a huge range of formatting and presentation options, and works with just about every online or desktop application you’re ever likely to use, there’s nothing to rival MathType. MathType 6.8 for Windows has just been released and it’s hard to imagine a more useful tool. It works with over 600 applications and websites, including 64-bit Microsoft Office 2010. It offers better accessibility for people with, for example, low vision; speech commands; handwriting input and much more. One major new feature of MathType 6.8 lets you paste a table from your spreadsheet, document or web page straight into MathType as a matrix – that’s really useful. Why not download our MathType 6.8 trial version today? Even if you don’t decide to buy it, after the 30-day trial has expired it reverts to the free MathType Lite which has a lot more functionality than Equation Editor, so it’s a win-win for you whatever you decide! One little-known feature of Mathcad 15 (and earlier versions) is the ability to connect to Internet data sources. Simply insert a scriptable component into a worksheet, define an input and an output, and insert this VBScript into the component code. IEGetPage(URL) is a function that downloads the data the URL points to. Outputs(0).value and Inputs(0).Value refer to the first input and output of the scriptable component. In this instance, the input would simply be a URL and the output would be the downloaded data. So what can I do with this surprisingly cool functionality? Well, the US Geological Survey host constantly updated earthquake data on their website. This data gives the location (i.e. the latitude and longitude) and magnitude of earthquakes over a rolling time period, and can be downloaded as a text file. http://earthquake.usgs.gov/earthquakes/catalogs/eqs7day-M2.5.txt is a typical example. This text file is updated several times a day with new earthquake data and can be downloaded straight into Mathcad using the VBScript given above. Check out this Mathcad worksheet (the link is at the bottom of this post). Once the data the data is in Mathcad, some parsing is needed to strip out headers and other unnecessary information. You can then manipulate and analyse the filtered data. My next mini-project (should I get some time off from the salt mines) is to project this earthquake data onto a globe. I’ve also connected Mathcad to other Internet data sources, including historical stock quotes and foreign exchange rates. Like many engineers, I use Mathcad as a scratchpad to jot down equations, model physical systems and explore technical ideas. My specialty is fluid dynamics and heat transfer, but I also dabble in electromechanical modelling. But deriving equations for dynamic engineering systems demands time and skill. I’ll be the first to admit that I often lack both. and convert these block-diagram models to Mathcad functions. The technology is a software tool called MapleSim. It has blocks for modelling electrical, mechanical, multibody, hydraulic, thermal and magnetic systems, as well as signal-flow functionality. The equations are already programmed in, so I don’t need to derive them. MapleSim also generates C code from your model (simply point-and-click). The code can be parameterised with any set of properties (for example, resistances, inertias etc) and includes a solver. This code can also be compiled to a Mathcad-compatible DLL. This, for example, is a MapleSim model of a DC motor with backlash and a PI controller. The model was created by dragging physical components on a workspace, then connecting them together. And this is the compiled function (after code generation) implemented in Mathcad. I’ve parameterised the Mathcad function with respect to the set point and controller gains, but I could have picked any other combination of properties. Compiling MapleSim code to a Mathcad-compatible DLL sounds tricky. You need some awareness of C coding, but you don’t need to be an expert or even consider yourself a competent programmer. Once you know the steps to follow, it’s simple and is mostly copy and paste. For anyone who wants to try, I’ve prepared a Visual Studio example project to make this easier (email me for the link). Converting block-diagram physical models to Mathcad functions is novel and has the potential to save countless hours. Given that the volume of coffee I drink is positively correlated with the amount of algebra I do, this approach could lower my blood pressure as well. For the second year running, Adept Scientific has won a Mathcad Global Award, reaffirming our status as the top Mathcad reseller worldwide. The ceremony took place at the end of October in Athens, Greece and was attended by hundreds of professionals representing resellers across the globe. Jessica Nielsen, Mathcad Sales Manager for Adept Nordic went up on stage to receive a medal which was presented by some of PTC’s top management. Not only does this award acknowledge the hard work and commitment of Adept’s team of specialists in supporting Mathcad users, but it also provides engineers with the perfect proof of quality of service when sourcing a proven Mathcad reseller.